We are excited that you have chosen to learn more about our admission process. 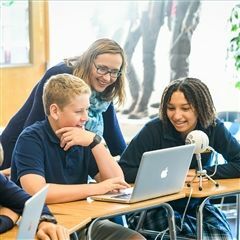 Annie Wright Schools offer internationally-recognized programs in an inquiry-based, nurturing environment for boys and girls aged 3 to Grade 12. Click on Lower, Middle or Upper School to follow the process specific to your child. Questions? Please contact Joy Phelps for Preschool-Grade 8 or Alyssa Harvey for Grades 9-12. Read to apply? Click here to begin your application. We can't wait to meet you!